I love finding new crock pot recipes! This one was absolutely delicious and jam packed full of flavor! My hubby LOVED it! It is extremely easy and very filling! This recipe looks CRAZY delicious. We kind of have an affliction to crockpot meals because they always taste the same, "crock potty." Will have to try this one out! I haven't bough pork chops in years because I never like how they taste, usually too hard and chewy. I'm going to try this because I bet the crockpot makes them tender and that gravy looks delicious! Thanks for recipe!! oh my gosh!! yum...i am still looking for cumin for your chicken crock pot recipe..maybe i can replace this...i am saving all your recipes and when i get around to it...i am gonna share with you...thanks ..this looks FABULOUS!!! Wow, does that ever sound and look tasty! It looks delicious. You have a wonderful combination of flavors such as roasted garlic, cream of chicken soup and ranch dressing seasoning. This is a recipe I know I will enjoy. Thanks. This looks absolutely delicious. I would love it if you would come share this over at the Holiday Sweet Swap that I'm co-hosting. Jump over to thestokerkitchen.blogspot.com and you'll see the button on the left sidebar. P.S. You really have been an inspiration for me!! Could you make this w/ chicken? Found your recipe on Pinterest. I made this tonight and it was a little salty for my taste and there really wasn't much gravy. It still tastes great however. I think next time, because there WILL be a next time, I may double the soup, hoping to get more "gravy" and spread the salty flavor out. Would like to try this, are these pork chops boneless or bone-in? I too have an aversion to "crock pot" meals, but this looked good, so I tried it tonight and it was excellent! I will make it again and thanks for teaching me about roasted garlic. Tried this meal tonight! It was a success!!! I made this for dinner tonight -- it was EXCELLENT!!!!! This is going to be a regular meal at our house! I made this for our Christmas dinner...ABSOLUTELY DELICIOUS...and so easy too..My family raved over it !!! Might try this with Chicken as the family doesn't care for pork chops!! Sounds DELISH!! delicious!!!!! I was thinking may be good with cream of mushroom soup too! Love your website! I am making the pork chops tonight! The energy bites look delicious too. I will be using several of your recipes to change up my dinner time rut! Thanks! Big hit with my family!! Lots of raves over the mashed potatoes!! LOVED this recipe! It was a bit salty, so next time I think I'll add an extra Cream of Chicken and a little less than the whole bag of Ranch Dressing....but otherwise, it was fantastic. The hubby said it was a keeper! This is salty because of the Ranch mix I used just barely any mix and it is great. I have mixed ranch dressing in with milk or mayo and brushed onto chicken before which is also great. Just tried this recipe......Absolutely amazing! I will be making this again. Like many others, I found these on Pinterest. They were really great! I made it with 3 really thick pork chops. Mine could have used a little more "sauce", but overall it was great. I made the mashed potatoes as well. My husband LOVED the meal! Made this tonight. I loved it. It was a hit and miss with my three kids. I think the mashed potatoes was the best part. Will def. be making those again! Made this tonight, and the pork chops were so tough, not even close to tender. So disappointed. I made this and it was delicious! The only pork chop recipe I like. And the potatoes were yummy too. However, I think it's critical to use the center cut pork loins (the boneless chops). I did and mine came out very tender, but my mom tried it using bone-in pork chops a couple of weeks later and they were tough. Will be trying this next Sunday. I make my menu's a week in advance. I can't wait to try this. I love crockpot recipes. So easy and delicious. BTW...I got this off of Pinterest and someone has reported your wonderful site as spam. We can't get to your recipes from there anymore. I know you are a fabulous cook and not spam at all. I thought I would bring this to your attention. Thanks again for the recipe. I know it will be delicious. I am making this in the crock pot as I type and I also found it strange that the recipe doesn't call for any additional water to thin the soup. I noticed that some people commented saying it turns out too thick but others say it is too watery? Not sure where the differences are coming from and would be interested to know what people are doing who get good results. This was AWESOME! My picky boyfriend loved it! I added half a can of Cream of Mushroom soup to the mix; should've added a whole can, it diluted the sodium and tasted perfect when paired with the mashed potatoes. With the garlic, I threw it in the pan with some EVVO and browned it (saved me 45 minutes). As college students, we love these recipes, keep 'em coming, please! OMGeeeeeeeeeeeeeeeeeeeeee, I saw a picture of this on Pinterest and made it tonight for Hubby and I and it was sooooooooooooooooo freakin' delicious!!! It has become one of our favorite dishes. Thank you so much for sharing!!! This looks so great. How would you modify it to make it on the stove top? I have pork chops out for dinner but I don't think I will have time to slow cook. Any ideas? yummmm!! Also saw this on pinterest.. will be making this tonight.. hope its good!!! I just found this on pinterest and plan to make it for tonight. I hope it is as good as it looks. Absolutely the best Pork Chops ever!! I'm making this tonight for part of my Crock Pot Challenge, how much time do you think I should cook it if my chops are frozen? Thank you, looks delish! Oh my! This recipe looks so good! 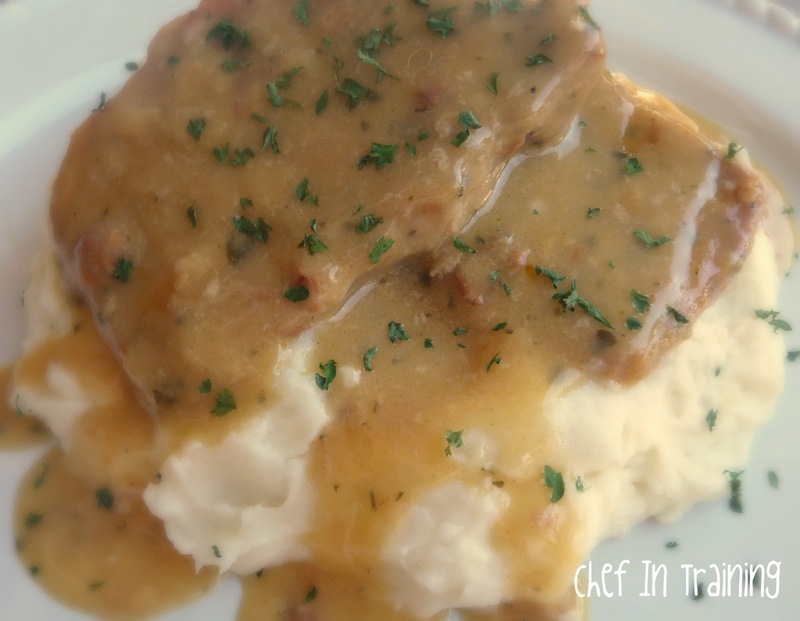 I love anything with mashed potatoes in it, ...and a crockpot recipe, what could be easier? Made this with cube steak instead of pork chops, turned out great. Made this tonight and it was so so super easy to make. Also the most tender pork chops I have ever made the bones fall right out!! It was delicous!!! I made my first recipe from Pinterest. It was delicious next time I may put potatoes in too. Thank you! I really enjoyed this recipe, it has a very unique taste. Made it for dinner tonight (11/19/2012), I love crockpot recipes. I definitely will be making this again. Should the sauce have a brown color to it as in the picture? Mine did not come out that color. Blanca, I had the same problem. I added a packet of pork gray mix to it. It did the trick!!! I had 2 recipes planned, one with an Italian season pkt and one with a ranch pkt. It wasn't until this was in the oven that I realized the mistake I made. I used the Italian pkt with this recipe. Honestly I can't imagine it beig any better than it was. This was delicious with the Italian. The mashed potatoes were so good. I served it with green beans in which I mixed some of the roasted garlic. A huge hit at my house! We have had this a few times, my husband loves it and my kids like a whole lot too! I have a question, since you roast the whole garlic (head) and only use half of the cloves, can you save the remainder of the garlic for another purpose in the fridge or freezer or is it just best to toss it? This is the first time I have remembered to roast it, other times I have just used my garlic press and it was delicious too:) Thank you for all your hard, yummy work! I made this last night for dinner. It was amazing!! Made this tonight. It was delicious. Followed recipe as it stands. I was skeptical about the sauce, but it was great! Potatoes were perfection. Great comfort meal. Will definitely visit this one again. Hubby and 20yo son loved it too! Hi, this looks amazing! I have what is probably a stupid question but I'm only fourteen so cut me some slack please? Haha anyway do the pork chops need to be flipped and if so how often? Thanks! Really want to make this for my mom! I made this Wednesday night. Only exceptions I used 8 porkchops & 2 cans cream of chicken & left the garlic out. It was soooooo good! I'm making this for the first time today. I'm using chicken breasts because I'm not a fan of pork chops. I'm a little worried about the sauce. How did yours come out brown? Looks good, but what do you do with the garlic? I am new to cooking, please don't laugh. What if you don't have a crockpot like me... Would this work in the oven or stove top? I did it in the oven the first time (baked covered at 350F and checked after an hour - I pre-browned so mine were done in an hour). They were delicious - but I made a note to thin out the sauce a bit with a splash of milk as it is a bit salty. Hi, I've made this 2 times now (once in the oven, once in the crockpot). Both times they were really good! I was just wondering if you brown your chops first? It would be nice to save a step. I have yet to make the potatoes though, I always have grated parmesan on hand but never fresh, could you substitute, and if so, how much grated Parmesan would you use? I made this last night and my husband and I both loved it! I think it's one of his favorite meals that I have made. The only thing I would add is another can of the soup because by the end of cooking, most of the gravy had cooked onto the side of the crockpot. Thank you so much for the great recipe. I'll definitely make this again! I made these today and they were moist and delicious. Thanks so much for the recipe. I'm not a cook by any means...but I followed this recipe exactly and it was great!! Pork chops fell off the bone. Gravy was great and potatoes were so good! Will definitely make again! This looks so good. I love pork and I'm going to try to this one pork and graveyard. This was good!!! I used boneless pork chops, and I added about 2 tbs garlic herb butter and a handful of grape tomatoes (to keep them from going bad!)! And 1/4 cup whit wine!!!! Oh so good! I want to use chicken next time and double the chicken soup and water, for more gravey!!!!! Excellent! !! I like to pour a little flavored (or regular) olive oil on my bunches of roasted garlic before wrapping the head in foil to bake. I just slice a nice little bit of the top off to open the head. The olive oil just seeps into every tasty flesh of the bulb. So sweet and tasty to spread on lots of things! I tried this great pork chop recipe last night and my husband really liked it....I didn't make the Parmesan Potatoes, my husband only likes regular mashed potatoes. Thanks for making a new dish that my "picky" eater enjoyed. Made this tonight and it was the most tender pork chop I've had in a long time. The gravy was delicious too! So simple! Thank you! Can I put the pork chops in frozen? Do you use boneless or with bone pork chops?